While some 20th anniversaries are celebrated with gifts of china or platinum, the passage of Proposition 10 that created First 5s in California in 1998 was marked on Nov. 9 by exchanging gems of progress, partnership and promise born of First 5 LA’s past two decades of work to improve the lives of young children and their families in Los Angeles County. 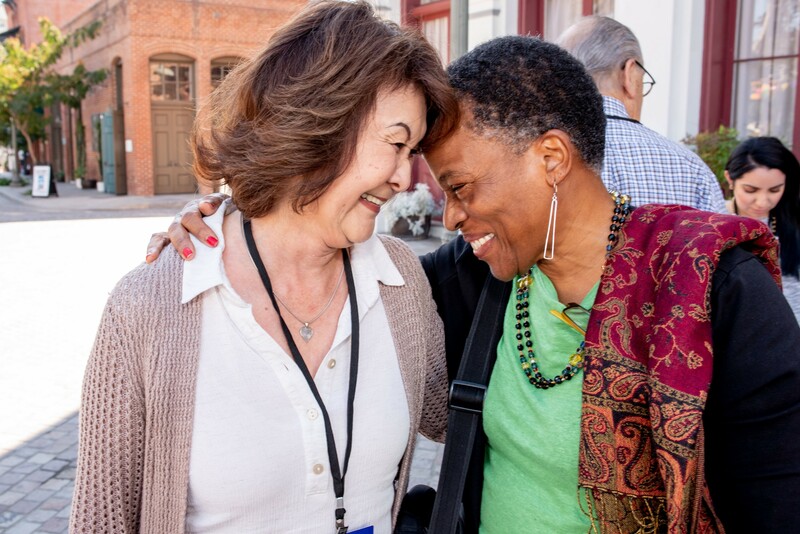 The anniversary event itself was steeped in history, drawing more than 150 invited guests to Pico House aside historic Olvera Street in downtown Los Angeles. Philanthropists and other partners, First 5 LA Commissioners past and present, elected representatives and government officials, grantees and other dignitaries celebrated amidst a backdrop of past accomplishments and an expert panel providing insights on the current state – and future – of early childhood. Although actor/director/producer Rob Reiner was not in attendance, his presence loomed large in First 5 LA Executive Director Kim Belshé’s opening remarks, which were rich in gratitude for his launch of the voter-passed proposition that created the statewide network of First 5s. In true cinematic fashion, Reiner provided his own reflections on the past two decades in a video that was shared at the event. Belshé, who served on the state’s First 5 Commission with Reiner in 1999 after the passage of Prop 10, noted that she had three nephews who were toddlers at the time. Now attending USC and on a path to success, Belshé noted that their path is “reflective of their opportunities and the strong foundations they experienced in life. Kuehl touted the impact of home visiting and other First 5 LA investments over the past two decades, from which key accomplishments were presented for guests in data boards at a gallery walk. Highlights of this data can be found in this section from First 5 LA’s new website, which was revamped in conjunction with the 20th Anniversary. “First 5 LA is the leader, First 5 LA is the visionary,” said Kuehl, who with Janice Hahn initiated a 2016 L.A. County Board of Supervisors’ motion to enhance and expand home visiting in the county – just the first in a number of significant developments in expanding home visiting at both the state and county level in which First 5 LA has recently been involved. 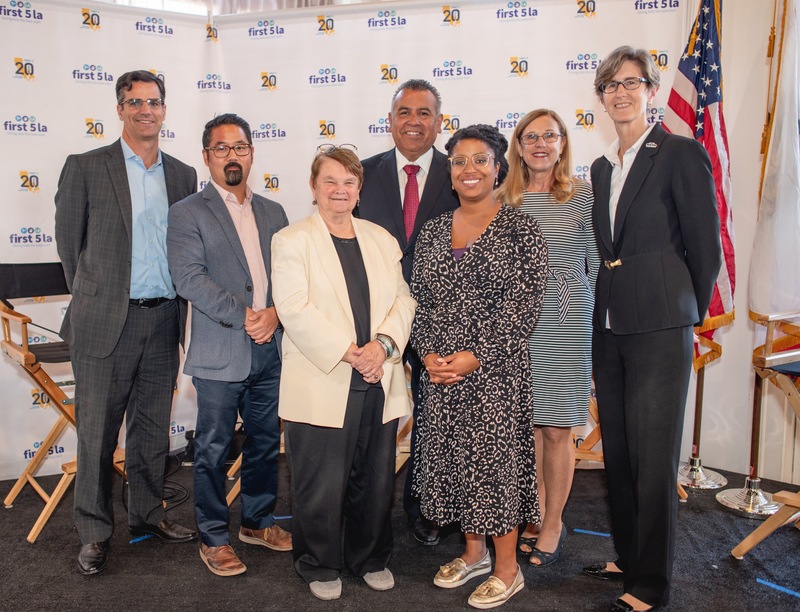 During the event, many in attendance had their own stories to share (see accompanying video) from the past two decades, during which time First 5 LA has evolved in its approach to improving outcomes for young children. Initially focusing on funding direct services, the agency’s 2015-2020 Strategic Plan combines key investments in four priority outcome areas with a focus on advocating for policy and systems change for a broader impact. In 2010, First 5 LA created and managed the Best Start Community Partnerships in 14 geographic areas throughout L.A. County, bringing together and amplifying the collective voice of parents, residents and leaders to help create lasting change in their communities that promote positive outcomes for young children and their families. Since its inception, Best Start has evolved into 14 local networks and 5 regional networks, engaging more than 21,000 parents and residents. The power of partnership with First 5 LA was praised by many of the past and present collaborators in attendance, including Dan Nieman, vice president of External Affairs with Para Los Niňos, which is the regional network grantee for Best Start Region 1. “First 5 LA has a laser like focus on getting our kids what they need to make sure they have a strong start,” Nieman said. “I think in the next five years it’s going to be even more exciting and fun to continue our partnership,” said Shannon Whaley, director of Research and Evaluation with Public Health Foundation Enterprises - Women, Infants and Children (PHFE-WIC), with which the First 5 LA Board this month approved an extended strategic partnership with First 5 LA on the Little By Little initiative. The event also created the opportunity to forge new partnerships, as well. 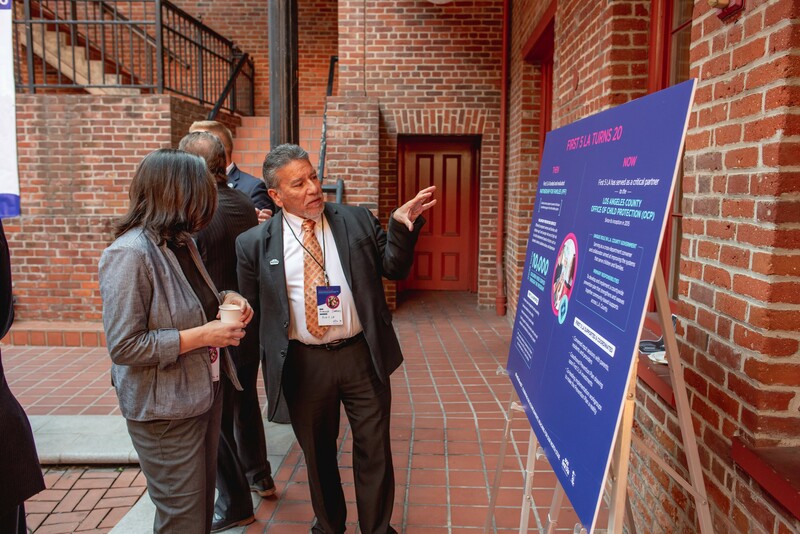 Joel Cisneros, director of School Mental Health for the Los Angeles Unified School District, came to see how the needs of the school district and First 5 LA overlap. Cisneros was happy to learn more about how First 5 LA is partnering with government agencies, funders and other public and private entities to advance trauma-informed systems change in L.A. County, including completion of an environmental scan, a report of recommendations and demonstration projects that pilot trauma and resiliency systems change strategies. “I’m very excited about the possibilities and figuring out how we can move forward together,” Cisneros said. For her part, Belshé thanked those in attendance who have worked with First 5 LA in the past and invited new partners to join First 5 LA in a better future, as defined by the agency’s overarching goal, or North Star: that by 2028, all children in L.A. County enter kindergarten ready to succeed in school and life. Understanding the current state of early childhood development is among the keys to ensuring the best start for kids today and achieving the goal of First 5 LA’s North Star in the future. To that end, the event featured a panel discussion by four experts in the areas of education, health, philanthropy and advocacy: Stanford University Professor of Education Deborah Stipek; Advancement Project Executive Director John Kim; Blue Shield of California Foundation President Peter Long; and Pomona Unified School District Superintendent Richard Martinez. At the end of the discussion, Neely asked each panelist what differences they hope to see for young children 20 years from now. Martinez was not the only one to share their inspiration from First 5 LA’s aspirations.